Dancing is pure fun. And it`s even better with good salsa music. Try these ten best salsa songs ever and enjoy your time on the dancefloor! Won the Latin Grammy award for Best tropical song and therefore does very well belong into the ranking of the best salsa music. This Scottish band mixes salsa music elements with traditional Scottish instruments, which turns out to be very easy on the ears. The latest smash hit by the Latin superstar – released in 2015 and his best salsa music song. “Que suenen suenen suenen los tambores oye!! que suenen suenen suenen los tambores oye!! Up tempo song and break-through hit in 1984 for this famous Columbian band. 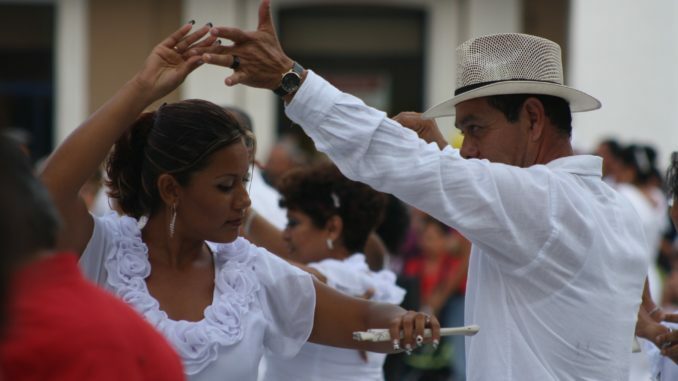 Dedicated to the “World Capital of Salsa” – Santiago de Cali. You probably wouldn`t expect this one in a ranking of good salsa music. But you should try it, works very well with the Salsa rhythm and is additionally very uplifting. The remix of Kevin Lyttle`s hit is an amzing piece of the best salsa music. Very energetic song! Guitar hero Santana with an amazing world-wide smash hit and surely one of the best salsa songs ever! From the great “Supernatural” album (released 1999) and of course awarded with a Latin Grammy for best album. “Aah aah ¡ay! Corazón espinado. ¡Cómo duele, me duele mamá! Aah aah ¡ay! Cómo me duele el amor. Great remix of Mark Ronson and Bruno Mars` smash single. It`s so much fun to dance salso with this beats. Should be played more often at parties! Of couse Latin music king Marc Anthony provides one of the best salsa songs of all time. He`s got even more (e.g. I need to know), but this one is certainly my favourite! The first place was never in doubt. Enrique Iglesias can do more than just romantic pop songs. He comes up with nothing less than the best salsa music song of all time. Hearing this song at a party, you just have to jump on the dancefloor and enjoy this perfect song! Do you agree with the ranking of the best salsa songs ever? Or is there any other piece of good salsa music that you`d suggest for this ranking? Have you ever tried dancing to bachata music? If not, I suggest you learn the dance as quickly as possible and enjoy the ten best bachata songs ever!